This painting forms one of a set of six views of the Piazza San Marco and the Piazzetta, at the heart of Venice. The series may have been Canaletto’s earliest commission from Joseph Smith, British Consul in Venice, who sold his outstanding group of paintings, prints and drawings by the artist to George III in 1762. The set is all of the same size and, judging from the compositions and broad handling of paint, was probably intended to be incorporated symmetrically into the decoration of a single Venetian room. A closely related preparatory drawing for each view (also in the Royal Collection) may have been the basis for discussion between artist and patron. The care taken over the composition of the architecture and the changes made during the course of painting suggest that the balance and effect of the whole was important to both of them. In each work viewpoints are combined and architecture moved and distorted, here giving weight to the right side of the painting. If the view of the Biblioteca Marciana is accurate, the column of San Marco should intervene between the Biblioteca and the distant Santa Maria della Salute, and the column of San Teodoro would be higher. In the preparatory drawing the column of San Teodoro is not included and the column of San Marco dominates the left side of the view. 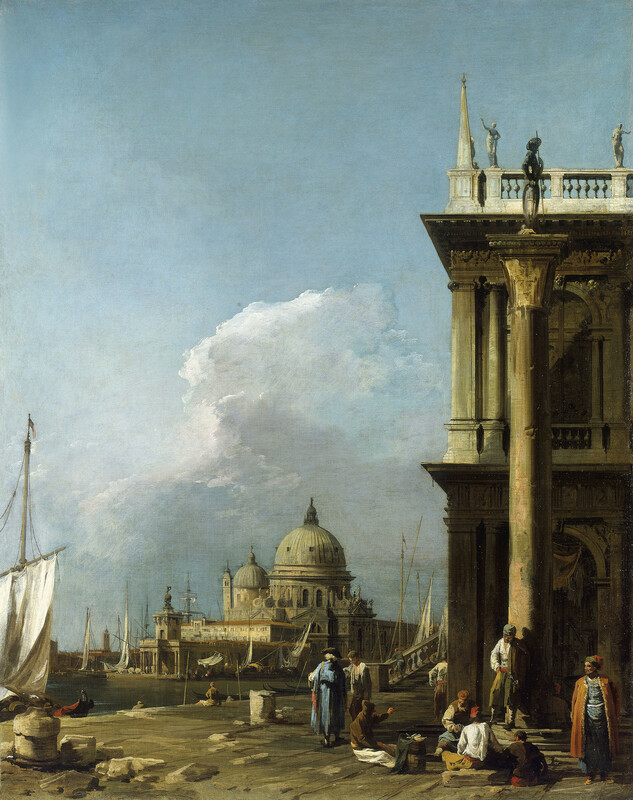 In the painting Canaletto included the column of San Marco and then painted it out, framing the left side of the painting instead with a mast and sail. The steps of the bridge, the Ponte della Pescaria, have been brought forward, the Dogana (Customs House) and the Salute are too close together and both bulk larger in the middle distance. There is visible evidence of Canaletto’s use of ruling instruments to lay in his design and outline architecture. Dividers outlined the dome of the Salute. Offsetting the grandeur of the architecture in sombre browns are the figures, their bright clothes caught dramatically in the late afternoon light, the artist brilliantly turning the thick paint with each stroke to assume the shape of the forms described.